WellEngaged is a proprietary laptop based application that delivers a customized presentation to the employee during their enrollment session. It is custom designed for every client to convey the message that is important to their employees and designed with the business goals of our clients in mind. Annual Enrollment serves as an opportunity to deliver important messages to employees concerning their benefits. Our WellEngaged software allows employers to craft a message with the details their employees need to hear. The WellEngaged software is used to communicate benefit changes, important messages concerning effective healthcare utilization, wellness programs, and other benefits driven intiatives. Not only does WellEngaged deliver information to employees, it is also used to collect important data. We help our clients collect key metrics concerning benefit program utilization directly from the employees. This data is integral to determining employee perception regarding benefit programs, especially ones that are under utilized. An example is the use of WellEngaged to discourage routine usage of emergency rooms for non-emergency visits by embedding a healthcare provider lookup into the presentation. Assisted by a benefits counselor, employees were able to find an in-network provider or urgent care center that was convenient to them instead of relying on emergency rooms for non-emergency care. WellEngaged was originally developed as a wellness engagement tool and that remains its underlying core competency. WellEngaged presents employees with key information about participating in wellness programs and the meaningful impact it has on healthcare costs. 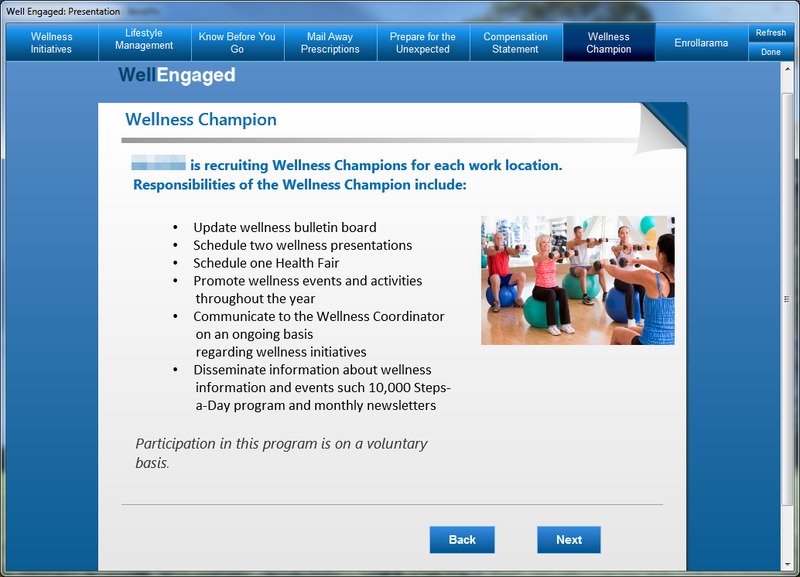 Not only does it educate employees on the value of wellness participation, it allows them to sign up on the spot. WellEngaged is a tool for employees to make measurable commitments to participate in different wellness initiatives or make pledges to participate in obtainable wellness activities, such as walking or playing a team sport twice a week.